Each year, animals die in large groups – in the hundreds, thousands, and hundreds of thousands all in one go. 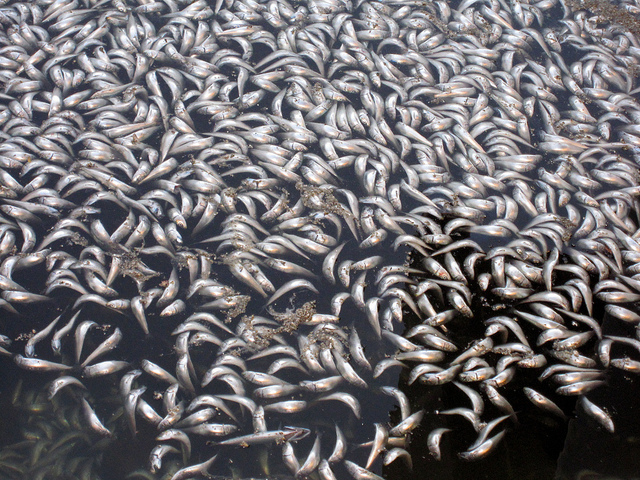 Beaches become littered with masses of fish with their bellies up, and birds drop dead from the sky in droves. As dramatic as they appear to be, such occurrences are not uncommon in nature, and are known as ‘mass mortality events’ in biology. In fact, usually these events have natural causes, such as disease outbreaks in the case of birds, or suffocating algae blooms in the case of fish. And for the most part of history, humans have not been around to witness them closely. Whenever people happen upon a case like this, it gets documented and investigated in order to find the most likely cause and determine whether it could have been a man-made problem that precipitated a mass die-off – such as pollution or other environmental stress. Sometimes, however, these events remain a mystery. Ecology is a complex matter, and minor changes here and there can have long-reaching consequences. While mass die-offs do not lead species to extinction, particularly bad ones can easily decimate large populations of animals, throwing the whole ecosystem out of whack. Unfortunately, the sad story gets worse. A brand new review of individual mass mortality events, published in the Proceedings of the National Academy of Sciences, has revealed a troubling sight. Ecology researchers from US Berkeley, University of San Diego, and Yale University joined forces to examine 727 reports of mass animal die-offs from the past 70 years, involving almost 2,500 animal populations. The data shows these events have been increasing in the avian and marine worlds. This means more dead fish, birds, and marine invertebrates than recorded ever before. While reports of mass animal mortalities have increased overall, even after taking this bias into account it is clear that some groups of animals are dying in mass events at a rate unprecedented in the modern times. The studies gathered also reported the causes of the die-offs, and amongst these the most common were diseases, followed by direct human interference, such as pollution or contamination. Amongst other common causes was algae biotoxicity, and various effects caused by climate disturbances. The researchers have concluded that knowledge from this review will help to create better reports in the future, and eventually deepen our understanding of environmental change at various levels. Even if we don’t know how to stop killing the fish, we can become better at understanding their deaths. Amongst all the gloom there was one bit of good news – reptiles and amphibians have been dying less. I wonder why.